If you’ve been looking for help ending clutter for good, this method is as easy as 1-2-3! The most significant obstacle to getting rid of clutter is that most of us make a big deal out of it. We look at our crowded kitchen counters or our jam-packed bedroom closets and believe we need to set aside an afternoon or maybe even an entire weekend to deal with them. There are more enjoyable things to do! Since it seems overwhelming, we put off dealing with the clutter, and it continues to grow. Soon, the mess on the kitchen counters takes over the table and maybe even a chair or two. The jumble in our bedroom closet spreads to the bedroom floor, the top of the dresser — anywhere where there’s space. And what happens to us? We start feeling stressed because clutter inundates our minds with too many stimuli. We feel guilty because we believe we should be able to do something about the mess. We feel drained every time we look at the problem and trapped because there’s no way to avoid looking at it since it’s everywhere. There’s an adage, which I discuss in my book 30 Days to a Clean and Organized House, about the best way to eat an elephant. The answer: one bite at a time. In other words, you don’t think about the enormity of the beast. You don’t think about how miserable you’re going to be the entire time. You certainly don’t think about how long it’s going to take you to do it. The same thing is true about dealing with clutter. 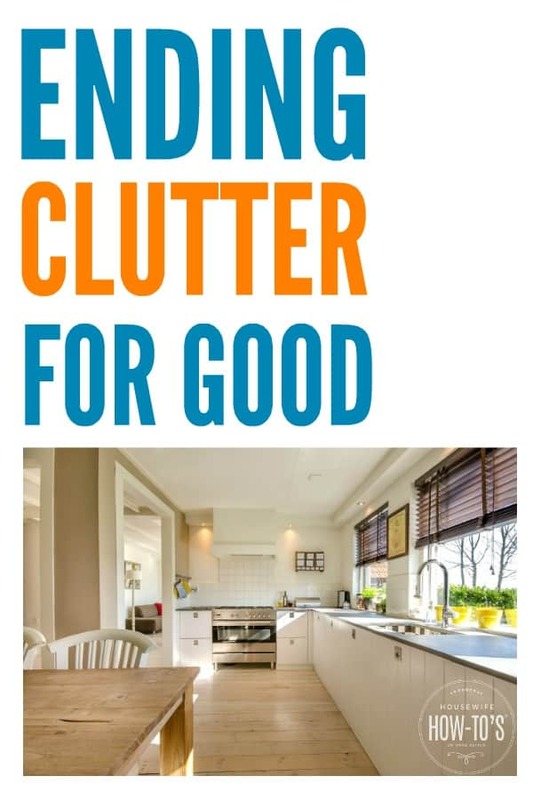 Once you get the hang of this approach to ending clutter for good, you won’t even have to think about it. It will merely be part of your average day and, by doing it day after day, you’ll have eaten that elephant — I mean, conquered that clutter. These steps are in order for a reason. It’s not merely because the 1-2-3 approach is catchy, though it is and that helps you remember it. The steps are arranged to help you focus amid the clutter and deal with it in small but significant bursts. Pick ONE area to tackle. If your home isn’t terribly cluttered, you can pick an entire room to work in but make it one which you cannot stand seeing messy. For those dealing with a significant amount of clutter, focus on the one area that is most affecting your day-to-day outlook. The point is to start with something that personally affects you — not your kids’ room, not your spouse’s dresser drawers, nothing that involves sorting through someone else’s stuff. This is about letting you see the rewards of your effort from the onset, so you stay motivated. Stand in that room, or face that intolerably cluttered area, and spend two nonstop frantic minutes grabbing everything that’s trash. Don’t think about it. Don’t debate yourself whether it’s something worth holding onto for the future. Don’t start rationalizing about how you might use it someday or that so-and-so might like it — if those things were true, you’d have used it by now or given it to so-and-so. It’s trash. Treat it as such and toss it. Find three things that belong somewhere else and take them there. Now. Kids’ shoes in your family room? Put them in their room. Dirty dishes on the coffee table? Take them to the kitchen. Library books to return? Put them on your seat in the car, so you remember to deal with them the next time you leave the house. If you followed the advice to spend just two non-stop minutes on picking up trash, you’ve only used about 5 minutes at this point. Do it again in two more rooms for a total of 3 rooms (15 minutes). Repeat this twice daily for a month, and you’ll be well on your way to ending clutter for good. That’s the key to making progress: for 1 month spend 2 times per day doing the above steps in 3 rooms. And don’t feel like you have to do it all by yourself, either! Have the kids help you do the 1-2-3 in the morning or after school — it’ll help them understand that picking up after themselves right away is easier than letting it pile up. Or have them do some chores kids can do while you’re doing the 1-2-3 steps, so they don’t start thinking of you as their maid. While the three steps above will help you get rid of the clutter, you might wonder how you’re supposed to prevent it from coming back. The answer is again as easy as 1-2-3. 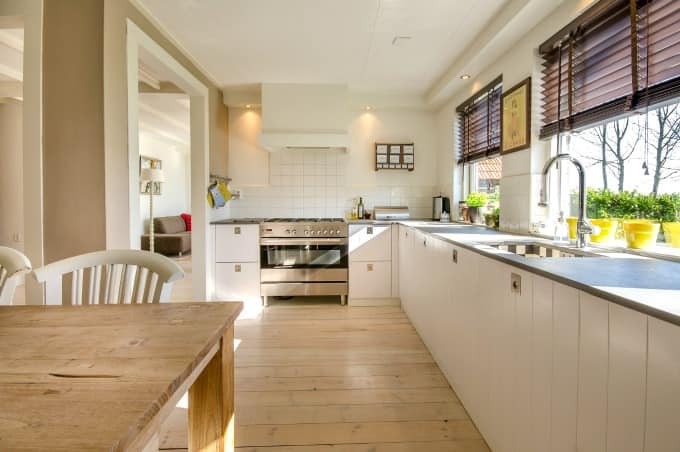 In every room of your house, pick one horizontal surface to keep entirely clutter-free. That means no frills, no pretty decor, no books or papers placed there for “just a second.” Nothing. It stays bare. Why? Because having one bare horizontal surface will prevent clutter blindness. Rather than walking into a cluttered room and seeing no mess, or ignoring it, your brain will register the contrast between this one bare surface and the clutter on the others. This, in turn, will help you notice when clutter begins to pile up again. Every day, spend two minutes in each common room of your home picking up trash. That means the kitchen, family room, living room and any shared bathroom. Again, don’t get caught up in whether you might use it one day or whether so-and-so might like it. If it’s broken, outdated, expired, if you haven’t used it lately or wouldn’t spend money on buying it today, get rid of it. Now, don’t let this turn into another elephant — it’s just two minutes per room, so unless you live in a mansion we’re talking maybe 15 minutes per day. Going through each room daily like this will also let you ensure that the 1 horizontal surface you intend to keep bare is, in fact, bare. Before you get anything new, make sure you have three strong reasons for bringing it into your home. But NOTE: I want it, I like it, or it’s on sale/free can’t be any of the reasons. Think about how careful you are about the Facebook links you share, the things you Retweet, and what you add to your Pinterest boards. You curate those things, carefully picking and choosing what you feel are the best, most important things to share or save. Well, keeping clutter from returning is a matter of curating the contents of your home. So, before you add something to your collection of possessions, make sure you have three good reasons for doing it. Do I or someone in the family need this? Do we have anything that would work just as well? Will we use this on a regular basis? Is it worth the money they want for it? Do I have a storage spot for it already, so it doesn’t just sit out looking like clutter? Will I still think it’s useful and necessary if I find myself picking it up every day and putting it back where it belongs? If you can’t answer yes to at least three of those, don’t bring it into your home. Want more guidance, such as a day-by-day plan and checklists to help you work through your home? Pick up a copy of my book 30 Days to a Clean and Organized House in paperback or for the Kindle. It’s an easy to follow plan which shows you how to clean, organize and, most importantly, keep it that way. I want to give this a try!! Now I have a question for you. Coupons you receive — Do you have a good way to keep track of them and where to put them or what to do with them?? I need help!! I keep coupons in an organizer and tuck that into my purse so it’s always with me. Before grocery shopping, I plan my menu then look through coupons to see what matches then take those and clip them together to the front of the organizer. While shopping, if I come across any in-store deals I’ll thumb through the coupons in the organizer to see if I can save more. Thank you thank you thank you! This is probably the easiest method to remember. It’s great because you don’t really need a lot of time and the results will be seen right away. I like to think of the number of times I fill a recycle bin or garbage can in the begining because the room’s transformation isn’t always seen immediately. That’s a great thing to focus on, Emily, because you are so right that the change isn’t always readily visible!